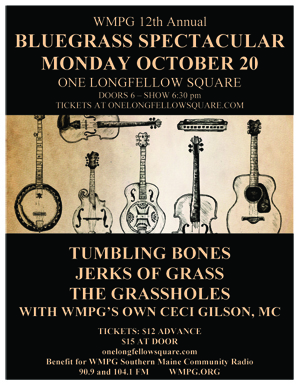 On Monday, October 20, WMPG Community Radio presented the 12th Annual Bluegrass Spectacular at One Longfellowsquare. Local Bluegrass legends, Tumbling Bones, The Grassholes, the Jerks of Grass performed. WMPG’s Ceci Gilson, host of Thursday’s “Kitchen Party” program was MC the evening. Doors opened at 6 PM and the place quickly filled to near capacity! Thanks to everyone who came to the show and especially the bands who were stupendous! All proceeds from the Bluegrass Spectacular benefited WMPG Community Radio. For more information contact Dale Robin Goodman at 207 780-4151 ordevelopment@wmpg.org. Click here for printable flyer for event.